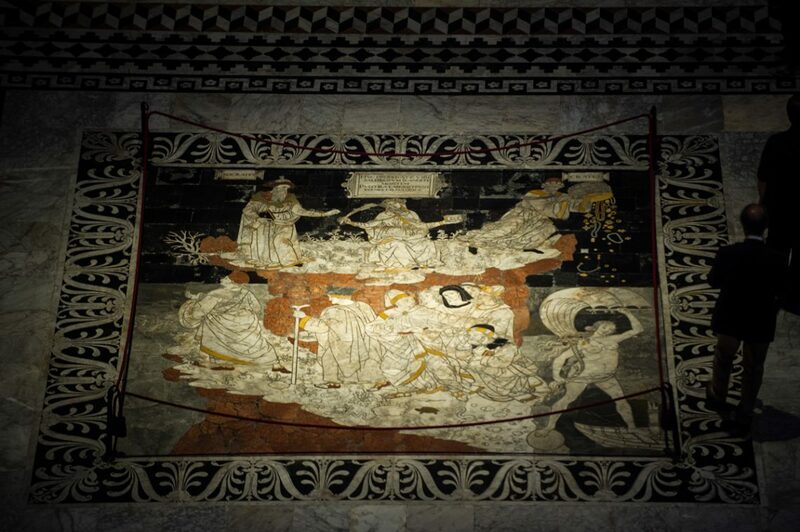 The Sibilla Cumea, one of the intarsia found on the floor of the Duomo in Siena, says “in lucem veniet” o Verrà alla Luce. The figure, attributed to the artist Giovanni di Stefano, uses the prophesy in which the Son of God appears as the Redemptor, after defeating death, to bring salvation to human kind coming back to life after the Resurrection. 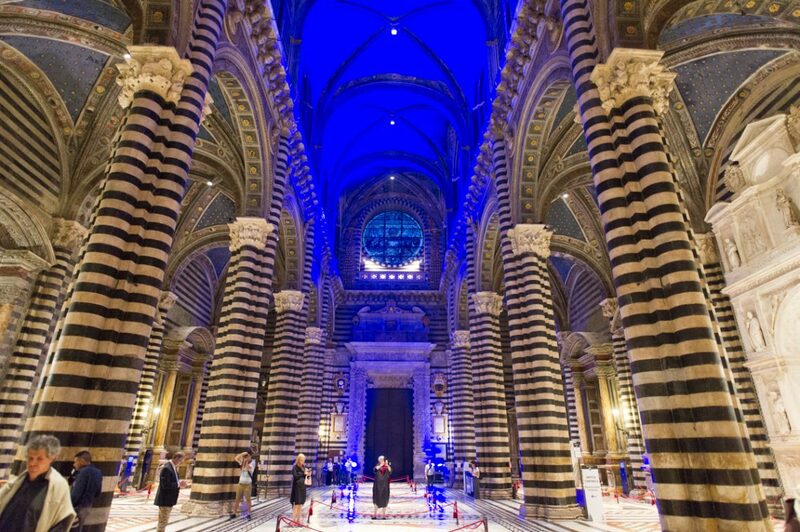 Thus on opening night, last night June 27th, a special night was planned in Siena with a light show to illuminate the Duomo with a special show. 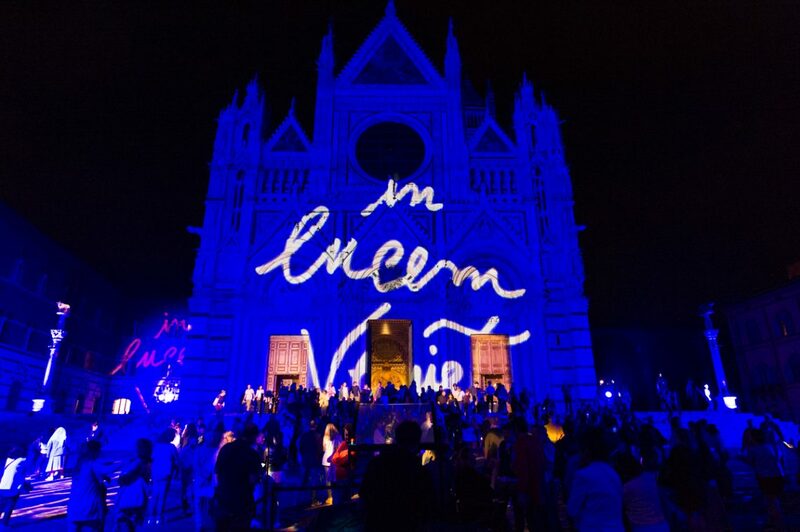 Directed by Marco Nereo Rotelli, the evening included a light and musical show on the facade of the Duomo which brought to life inspiring interpretations of knowledge and wisdom. 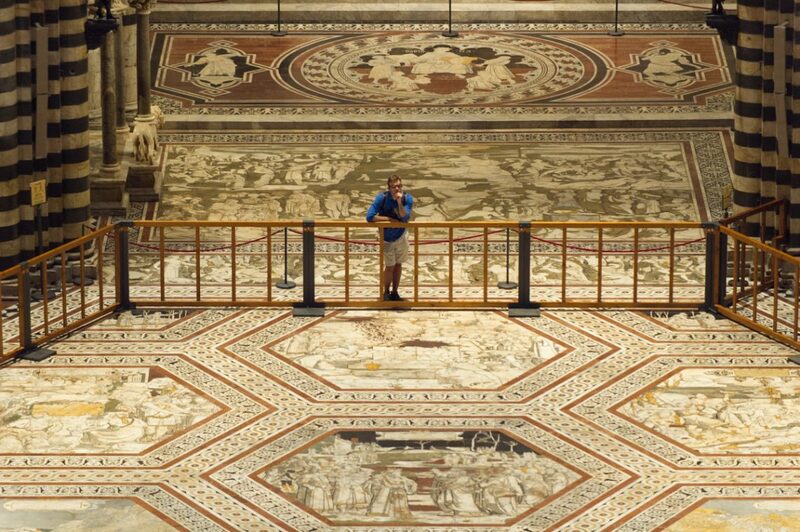 An interesting way to appreciate the unique masterpiece that is the entire Duomo, with an emphasis on its beautiful pavement. 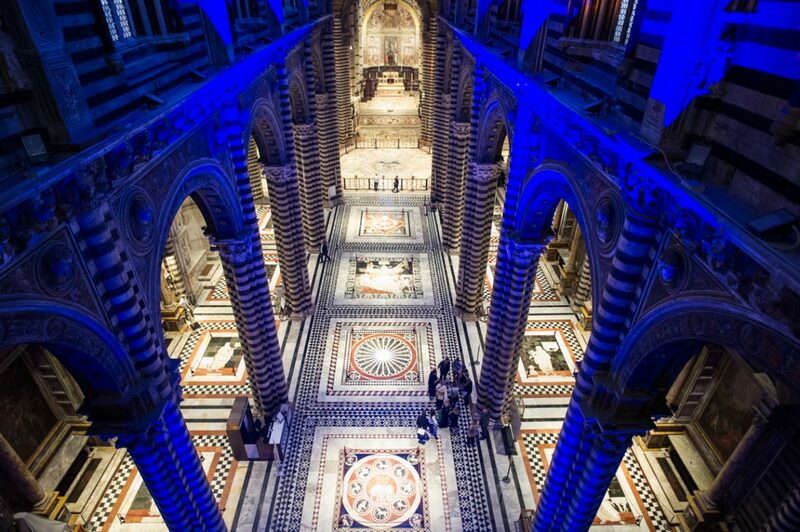 For a special night, the Duomo di Siena permitted visitors to enjoy the cathedral as a live metaphor, as a magic page of poetry that is beautiful. 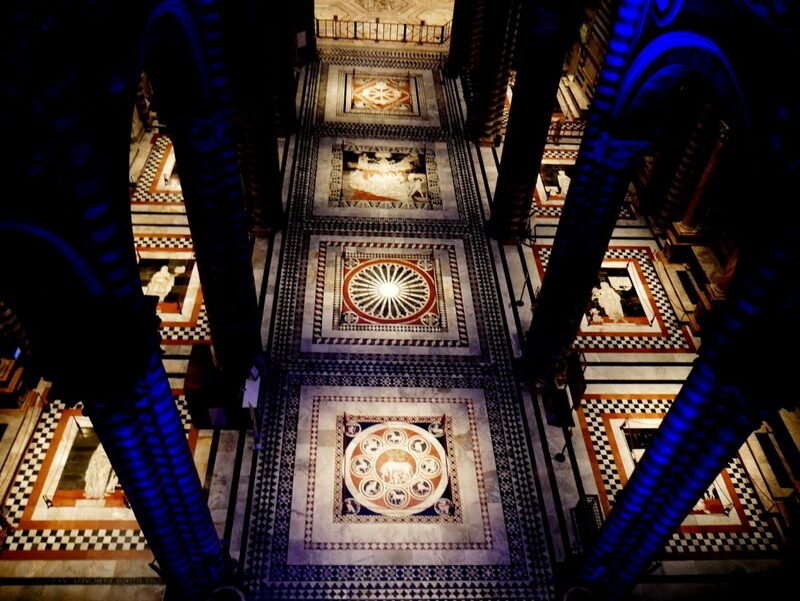 While that night is past, visitors to the cathedral for the rest of the period of the special opening – it is only at this time that visitors can see the entire floor uncovered – with new special lighting that highlights the chromatic colors of the pavement’s intarsia marble “carpet” courtesy of Opera Laboratori. You might think the Duomo and its pavement have only been known by visitors in recent times, but ever since the end of the 19th century, when foreign visitors did their Grand Tour in Italy and defined the pavement as the “wonder of Siena“, the interior of the Duomo has actually been known and appreciated worldwide. Not only does the look of the pavement render the Duomo unique, but the symbolic meaning of each and every square contributes to making the floor of the Duomo very special to residents and visitors alike. 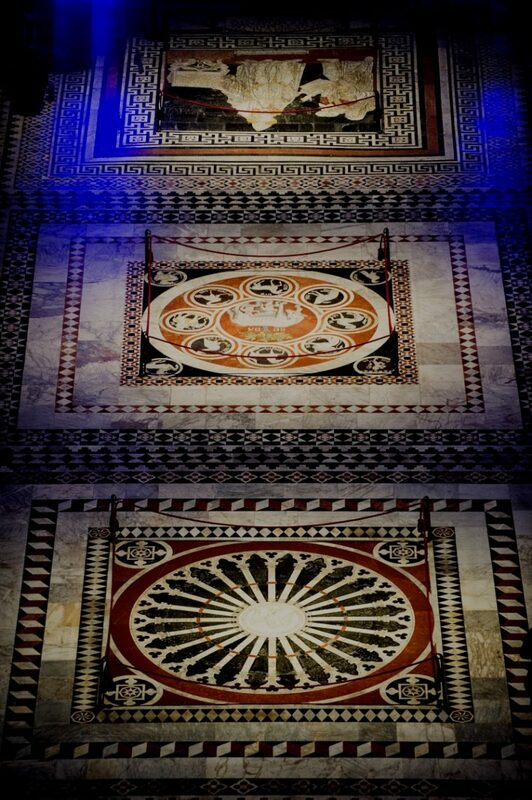 Over 500 years in the making, the floor speaks of philosophers and their wisdom, of prophesies and of biblical stories. Make sure to go visit and enjoy exploring each of the squares – and if you’re intrigued to learn more, stop by the bookshop before leaving to get a book that explains the stories across the entire floor. Photos courtesy of Opera Laboratori.